1) You can't selectively choose to back up and restore your SMS data only. You have to back up all the data on your phone. 2) Whenever you back up your iPhone using iTunes, it can overwrite previous backups that you might have made. 3) If you use iCloud, it only gives you 5 GB of free space, and you have to start paying after that. Since you can't just back up your SMS messages alone, and you have to back up your whole phone, it's very easy for you to go over the limit. Step 1. 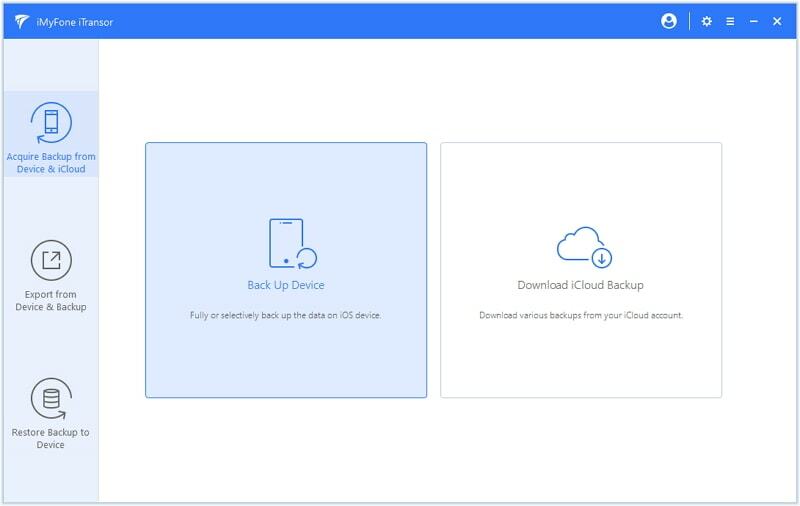 Run the program and click the Back Up Device option on the Acquire Backup from Device & iCloud tab. Step 2. Connect your device to the computer. 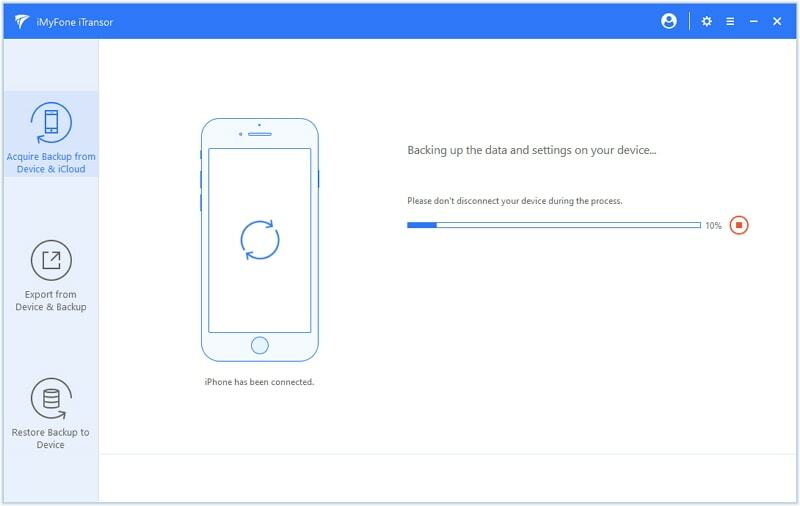 After the program recognizes your device, select only Messages on the right side, and choose a location on your computer to save the backup file, and then click Back Up down below to continue. Step 3. The program will start backing up messages in your device. This will take a while, and you can wait until it's finished, and go to the backup location to check the file. 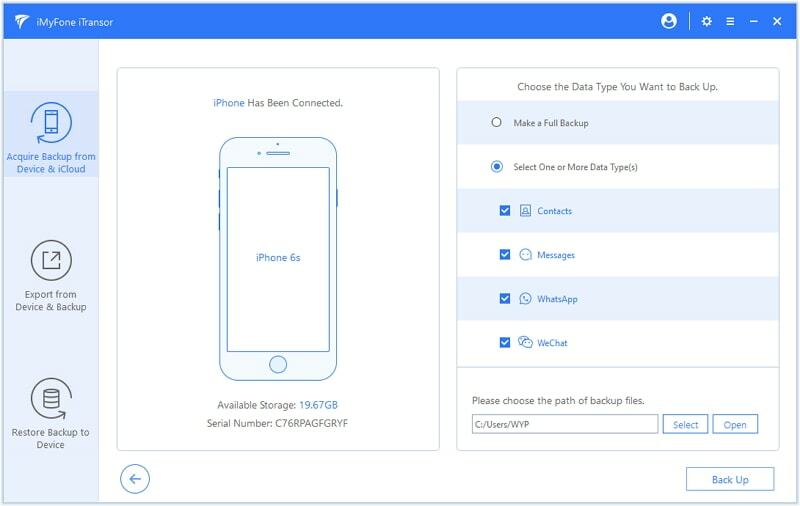 While you can use iCloud or iTunes to make whole backups of your device, if you want to just back up one kind of data only—such as SMS messages—then you will need to use more advanced software. iMyFone iTransor is a great SMS backup and restore app for iPhone that gives you the freedom to back up and restore your SMS messages selectively.